Click on this image for further information. The stunningly-beautiful Franco-Flemish antique harpsichord harpsichord pictured above is for sale. This harpsichord was originally made in Antwerp in 1617, but although the date is known, the original maker is unknown. It was originally a double-manual harpsichord with two keyboard at pitches a fourth apart, and the usual 1x8', 1x4' disposition with 4 registers - two for each keyboard. Although it has a genuine early Ioannes Ruckers soundboard rosette, analysis shows that it was not made by a member of the Ruckers family. The soundboard rosette, as so often happened in instruments subjected to a ravalement, came from a genuine instrument by Ioannes Ruckers, and was fraudulently place in the soundboard of this instrument, probably to increase its value in the later period. Before it was subjected to a major ravalement in 1750, it was given an intermediate petit ravalement at an unknown date. This involved aligning the keyboards, adding a top d3, and probably adding an extra string to give it a 2x8', 1x8' disposition. Later it was mis a ravalement in Paris in 1750 by François Étienne Blanchet who extended the compass downwards to F1. But it was then subjected to a further ravalement in 1786 by Jacques Barberini and Nicolas Hoffmann who extended the treble compass to f3, and probably added a genouillère and an additional row of peau de buffle jacks. It is now a classic French double-manual harpsichord with a full 5-octave compass of F1 to f3, and a disposition with 2 x 8', 1 x 4' and a peau de buffle set of jacks making up altogether a full four registers. It has a stunningly-beautiful decoration with an outer case decorated in gold vernis martin with case and lid figure-paintings attributed to the circle of François Boucher, and ornaments around these by Christophe II Huet. The stand is carved and gilt in a French Rococo style. It must belong to the 1786 ravalement state since it has never been widened to accommodate the additions to the case to take the compass up to f3. The sound is pure, full, rich and evenly-balanced across the whole compass and creates an impression of immense power and opulence. 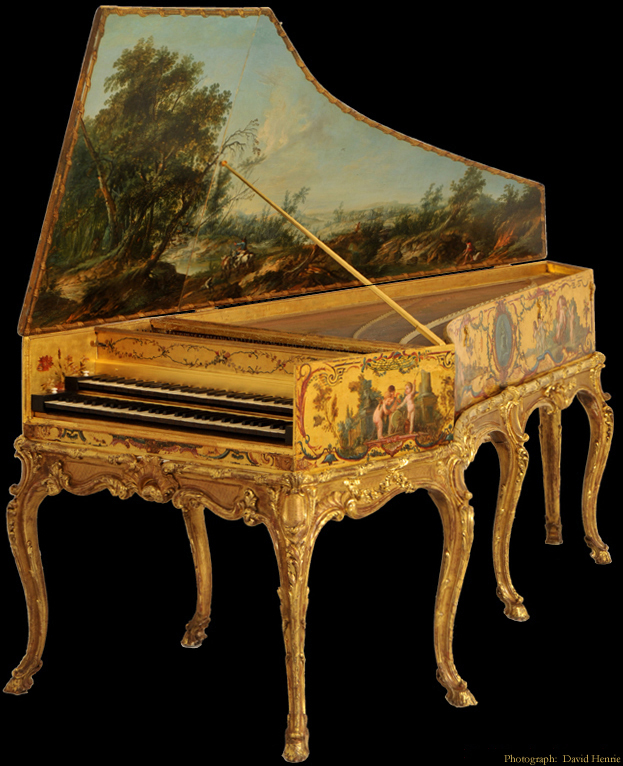 The above facts make this one of the most important Franco-Flemish harpsichords and certainly one of the most striking harpsichords to come out of any Parisian eighteenth-century workshop in the entire history of harpsichord making in Europe. Re-published as a digital reprint by Cambridge University Press, 2008. Buy a signed copy with a personal dedication (click here). A small amount of the important woods normally used by harpsichord makers is available for sale. This is all very well-seasoned and of the highest quality available. The types of wood include accurately-quartered Italian spruce soundboard wood. This soundboard wood is sold only in flitches of about 6 to 15 planks. Each flitch is a succession of slices from the same tree, and these can be used (as most Flemish and French makers did) to make a soundboard that is perfectly uniform in colour and texture because it is all of exactly the same wood for the whole of the soundboard. Also available is knot-free Italian cypress from Tuscany (cipresso netto) and genuine African ebony (Diospyros crassiflora). All of this wood was bought as air-dried, and is now more than 30 years old. For further details of quantities and prices please see the woods section of this site. My new e-mail address: Please follow the 'Contact details' link in the column on the left. The number of visits this site had received since January, 2003 is .